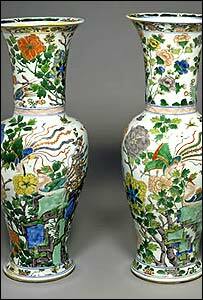 BBC NEWS | UK | Magazine | How do you fix a smashed antique vase? 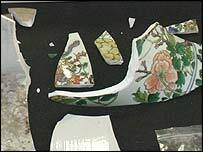 When a visitor to a Cambridge museum tripped over his shoelaces he smashed a set of 17th Century Chinese porcelain vases into pieces. Conservators have now pledged to glue them back together, but how? The body in question was Nick Flynn, who had accidentally fallen into three of the Fitzwilliam museum's Qing dynasty vases, breaking one and crunching two into small pieces (Mr Flynn, himself, was unharmed). Collecting the pieces took more than two days - filling 25 trays with fragments ranging from big chunks to tiny shards, which had been strewn around the stairs and further damaged by first-aiders going to help the fallen Mr Flynn. 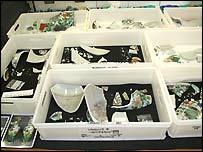 "It was like an archaeological dig, very meticulous, very systematic," said a museum spokeswoman. After this initial phase of recovering the pieces, the museum is now planning to appoint an expert to restore the vases. Jo Dillon, the museum's objects conservator, is optimistic that the vases can be put back together successfully, because the breaks - porcelain falling on marble - were unusually clean. Staff gathering pieces wore plastic gloves to stop the oil and grease from their hands interfering with these clean edges. The process is going to take months rather than weeks, says the museum spokeswoman, and the damage is still being evaluated. A professional tutor in repairing porcelain, Roger Hawkins, foresees a very intricate job which will consume a "huge amount of time". The pieces will be re-assembled in stages, gradually building up the shape of the original, with smaller fragments being handled under magnification. They will be put back together using specialist glue, which has to be sufficiently flexible and long lasting and must not discolour over time. The sort of super-strength glues available on the High Street are not effective for such tasks, he says, because they can be weakened by ultra-violet light and lack the flexibility needed for a perfect alignment. For complicated repairs, it can mean attaching pieces around a form which is made in the shape of the interior of the vase. And the assembly process must be carried out in a way that will not "lock out" the insertion of the final pieces. Meanwhile, the case of the broken vases in Cambridge, like any decent whodunnit, is creating its own controversies. The museum is unhappy at claims that Mr Flynn has been banned from the premises - and says that it has received e-mails from people protesting at his exclusion. The value of the damaged vases - three out of a set of five - has also fluctuated according to different reports, when in fact, the museum says it always refused to reveal their value. The museum's director, Duncan Robinson, is confident about the repairs. "We're not going to use the word 'lost'. We're going to use the words conservation, re-construction and eventually, re-display."